"He's damaged goods… But he's manageable." Bleecker Street Films has unveiled the first official trailer for political thriller Beirut, which will be premiering at the Sundance Film Festival in a few weeks. Set in the 1980s, the film stars Jon Hamm as a US diplomat who flees Lebanon in 1972 after a tragic incident at his home. Ten years later, he is called back to war-torn Beirut by CIA operatives in order to negotiate for the life of a friend he left behind. The full cast includes Rosamund Pike, Shea Whigham, Dean Norris, Mark Pellegrino, and Larry Pine. At first glance, with Rosamund Pike, this already reminds me of the hijacking thriller 7 Days in Entebbe, but this film tells a completely different story. I already have plans to see this at Sundance, and will report back. The trailer looks intriguing, I'm looking forward to watching it. See below. Mason Skiles (Jon Hamm), a top U.S. diplomat, left Lebanon in the 1970s after a tragic incident. Ten years later, the CIA calls him back to a war-torn Beirut with a mission only he can accomplish. Meanwhile, a CIA field agent who is working undercover at the American embassy is tasked with keeping Skiles alive and ensuring that the mission is a success. Without knowing who is on his side and with lives on the line, Skiles must outmaneuver everyone to expose the truth. 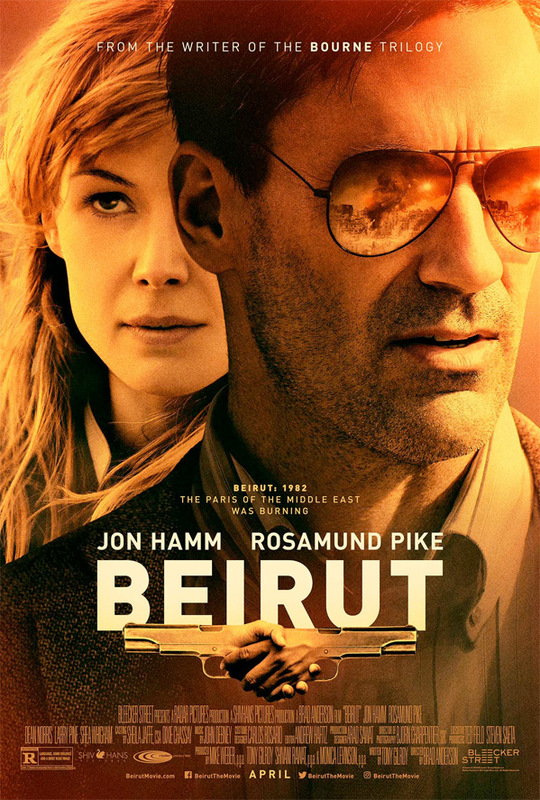 Beirut is directed by filmmaker Brad Anderson, of the films The Machinist, Transsiberian, Vanishing on 7th Street, The Call, and Stonehearst Asylum. The screenplay is written by Tony Gilroy (of The Bourne Identity / Supremacy / Ultimatum / Legacy, Michael Clayton, Duplicity, State of Play, The Great Wall). This will premiere at the 2018 Sundance Film Festival this month. Bleecker Street will then release Beirut in select theaters starting on April 13th in the spring.